Two brass plaques presented to Bruce Smith in recognition of his achievements in his Heisman winning year, 1941. 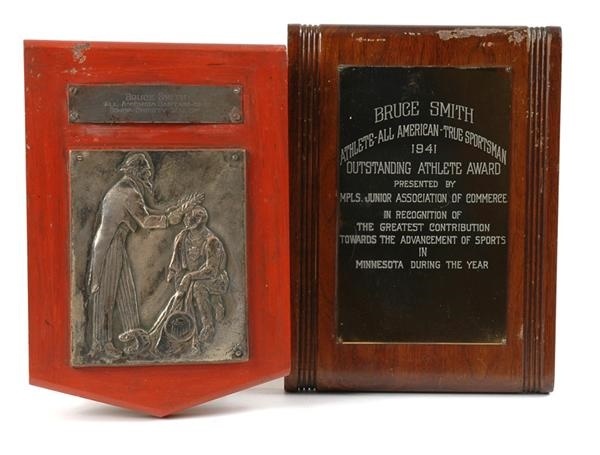 One is mounted on dark brown wood and reads “Bruce Smith Athlete-All American-True Sportsman 1941 Outstanding Athlete Award Presented By MPLS. Junior Association of Commerce In Recognition of the Greatest Contribution Towards the Advancement of Sports in Minnesota During the Year.” The whole piece is 13” X 9-3/4”. The second plaque is mounted on a (12-1/2” X 8-3/4”) piece of reddish wood (repainted). It consists of two pieces; the first reads “Bruce Smith All America Captain - 1941 Donor Christy Walsh.” Under that is a larger plaque showing Uncle Sam putting a wreath on the head of a kneeling football player. The condition is VF+. It is of unknown origin.